Nikola Tesla was born during a lightning storm at the stroke of midnight on the 10th of July 1856. His midwife is reported to have exclaimed, “He’ll be a child of the storm,” to which his mother replied, “No, of light.” His parents were both Serbian, although he was born in present-day Croatia, where he spent his early life. 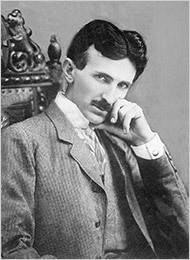 Tesla was educated in Karlovac, in Croatia, before going on to study electrical engineering in Graz, Austria. In 1881, he moved to Budapest to work as chief electrician for the American Telephone Company. During his time with the company, Tesla invented a device known as the telephone repeater, a precursor to the modern wireless telephone, although he did not patent his invention until many years later. In 1882, he moved to Paris to work as an engineer for the Continental Edison Company, where he began to develop devices that utilized rotating magnetic fields: the prototype of the induction motor. Two years later he moved to the United States to work for the Edison Company in New York. He arrived in the country with 4 cents in his pocket (he had been robbed aboard ship), a book of poetry and a letter of recommendation. While working for his new emmployer, Edison offered Tesla $50,000 if he could improve upon his design for DC dynamos. Tesla worked for nearly a year on this and made considerable improvements, but when he approached his boss for the money he was told, “Tesla, you don’t understand American humor.” This blow caused Tesla to resign, and to form his own company, Tesla Electric Light and Manufacturing, but this came to nothing as his investors pulled out over his plan for an alternating current motor. Subsequent unemployment drove the scientist to work as a laborer for a while, in order to finance his next project. In April 1887, Tesla began investigating what would later be called X-rays, experimenting with high voltages and vacuum tubes. He became a US citizen in 1889, and two years later established his own laboratory in Houston Street, New York, where he lit up vacuum tubes as evidence for the potential of wireless power transmission. He went on to demonstrate the first neon light tubes at the prestigious World Columbian Exposition of 1893 and, more importantly, illuminated the Exposition with electricity that used his alternating current, removing any doubt about its usefulness. During this period, direct current was still the standard, and Edison, who was unwilling to lose patent royalties on DC current to a former employee, misused Tesla’s ideas to construct the first electric chair for the state of New York in order to promote the idea that alternating currents were deadly. Soon, Tesla was in partnership with George Westinghouse to commercialize a system of transmitting power over long distances. Together they won a contract (over Edison and General Electric) to harness the potential of Niagra Falls and generate hydro-electricity. 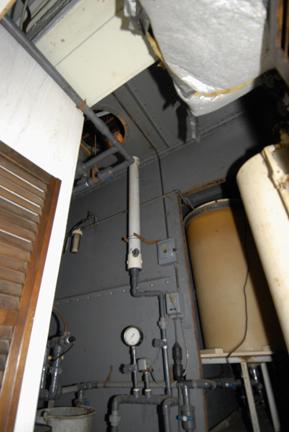 Eventually, Edison’s General Electric Company reluctantly adopted Tesla’s AC system. Tesla went on to invent numerous gadgets and devices, many of which were way ahead of their time. Some, such as radio remote-control systems and electric igniters for internal combustion engines, are still widely used today. In 1899, Tesla moved his research to Colorado Springs where he devoted himself to experiments with high voltage and electrical transmission over distances. Here he constructed electrical devices of Dr. Frankenstein proportions, most notably his Magnifying Transmitter, a 52-foot diameter electrical coil that was capable of generating millions of volts and sending lightning arcs 130-feet long. Witnesses claimed that they saw a blue glow like St. Elmo’s Fire emanating from the environs of the laboratory, with sparks emitting from the ground as they walked. On one occasion, a backfeeding power surge blacked out the whole of Colorado Springs. During his time in Colorado, Tesla recorded cosmic waves emitted by interstellar clouds and giant red stars, which prompted him to announce that he was possibly extraterrestrial radio signals. But the scientific community did not share his enthusiasm and rejected Tesla’s data; research into cosmic signals – radio astronomy, as it is known today – did not yet exist. Undaunted, Tesla would spend the latter part of his life trying to send signals to Mars. In the early years of the 20th century, Tesla fell down on his luck. 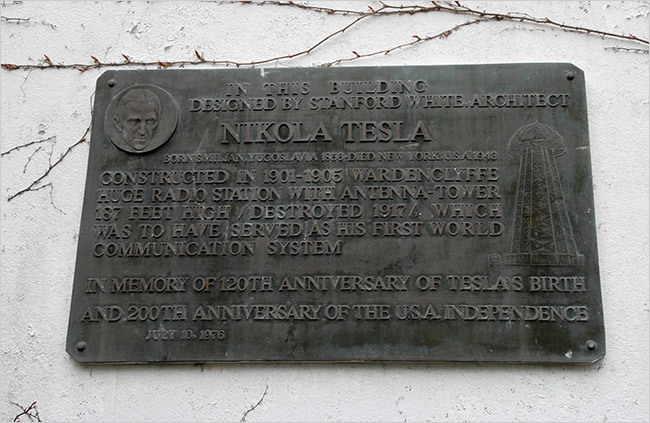 In 1904, the US Patent Office awarded the patent for radio to Marconi, even though this innovation was clearly based on Tesla’s earlier demonstrations, and in May 1905, some of Tesla’s patents expired, halting his royalty payments. In 1907, in financial crisis, he freed Westinghouse from payment on his induction motor patent for a nominal sum. Lack of funds meant that his biggest project so far, the Wardenclyffe Tower facility on Long Island, begun in 1900, had to be abandoned. By 1916, he was living in poverty; and it was around this time that Tesla started to exhibit symptoms of obsessive-compulsive disorder: he became obsessed with the number three – very Serbian – and felt compelled, for example, to walk around a block three times whenever he needed to enter a building. His genius was still undiminished though, and in 1917, he set out the principles of modern military radar in the Electrical Experimenter journal. He even developed the concept of something he called the “death ray”, an idea he tried to get Neville Chamberlain, the British Prime Minister of the time, interested in. But Tesla was a gentle, altruistic soul who hated war, and even his proposed death ray, or teleforce, was primarily a defensive weapon, a particle beam that would supposedly protect a nation from invasion by air or sea. By the time of his death in 1943, Tesla had more than 700 patents to his name. But that did not stop him dying half-forgotten and in debt. Despite his scientific genius, he was a naive businessman who was frequently used by contemporaries whose names are far better known than his today. In 1901, Nikola Tesla began work on a global system of giant towers meant to relay through the air not only news, stock reports and even pictures but also, unbeknown to investors such as J. Pierpont Morgan, free electricity for one and all. It was the inventor’s biggest project, and his most audacious. But the system failed for want of money, and at least partly for scientific viability. 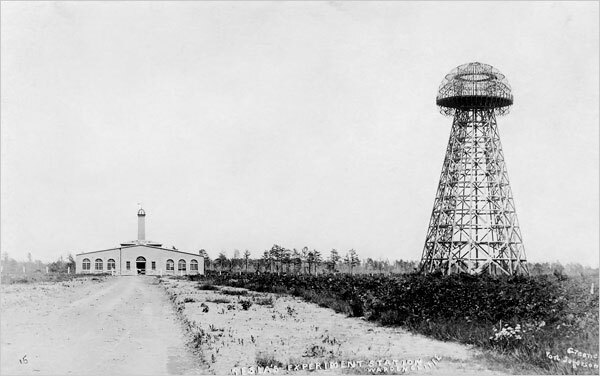 Tesla never finished his prototype tower and was forced to abandon its adjoining laboratory. 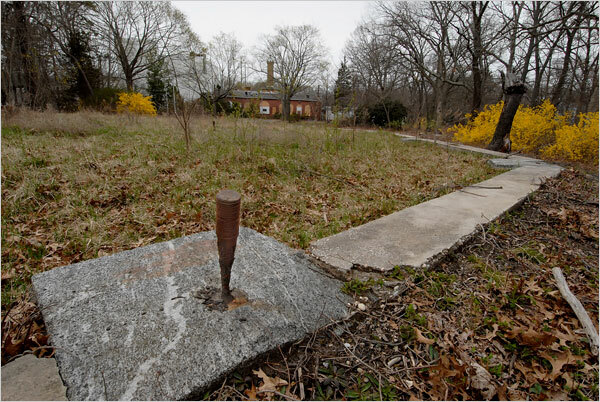 Today, a fight is looming over the ghostly remains of that site, called Wardenclyffe — what Tesla authorities call the only surviving workplace of the eccentric genius who dreamed countless big dreams while pioneering wireless communication and alternating current. 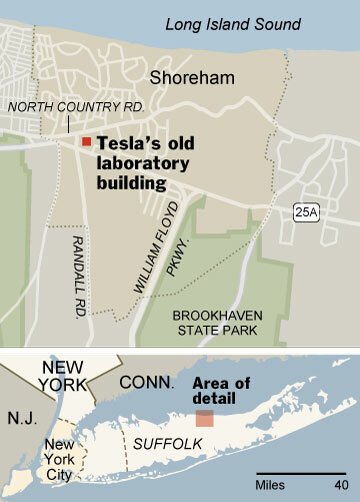 The disagreement began recently after the property went up for sale in Shoreham, N.Y.
A science group on Long Island wants to turn the 16-acre site into a Tesla museum and education center, and hopes to get the land donated to that end. But the owner, the Agfa Corporation, says it must sell the property to raise money in hard economic times. The company’s real estate broker says the land, listed at $1.6 million, can “be delivered fully cleared and level,” a statement that has thrown the preservationists into action. The ruins of Wardenclyffe include the tower’s foundation and the large brick laboratory, designed by Tesla’s friend Stanford White, the celebrated architect. Recently, New York State echoed that judgment. The commissioner of historic preservation wrote Dr. Seifer on behalf of Gov. 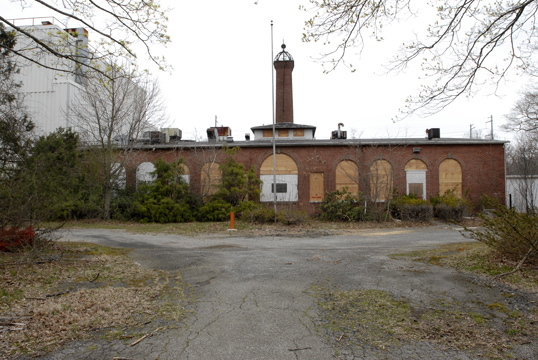 David A. Paterson to back Wardenclyffe’s preservation and listing in the National Register of Historic Places. 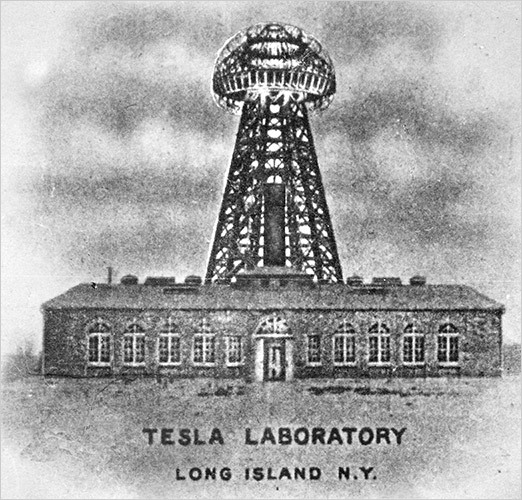 On Long Island, Tesla enthusiasts vow to obtain the land one way or another, saying that saving a symbol of Tesla’s accomplishments would help restore the visionary to his rightful place as an architect of the modern age. “A lot of his work was way ahead of his time,” said Jane Alcorn, president of the Tesla Science Center, a private group in Shoreham that is seeking to acquire Wardenclyffe. Tesla, who lived from 1856 to 1943, made bitter enemies who dismissed some of his claims as exaggerated, helping tarnish his reputation in his lifetime. He was part recluse, part showman. He issued publicity photos (actually double exposures) showing him reading quietly in his laboratory amid deadly flashes. Today, his work tends to be poorly known among scientists, though some call him an intuitive genius far ahead of his peers. Socially, his popularity has soared, elevating him to cult status. Books and Web sites abound. Wikipedia says the inventor obtained at least 700 patents. YouTube has several Tesla videos, including one of a break-in at Wardenclyffe. A rock band calls itself Tesla. An electric car company backed by Google’s founders calls itself Tesla Motors. Wardenclyffe epitomized that kind of visionary impracticality. Tesla seized on the colossal project at the age of 44 while living in New York City. An impeccably dressed bon vivant of Serbian birth, he was widely celebrated for his inventions of motors and power distribution systems that used the form of electricity known as alternating current, which beat out direct current (and Thomas Edison) to electrify the world. His patents made him a rich man, at least for a while. He lived at the Waldorf-Astoria and loved to hobnob with the famous at Delmonico’s and the Players Club. Around 1900, as Tesla planned what would become Wardenclyffe, inventors around the world were racing for what was considered the next big thing — wireless communication. 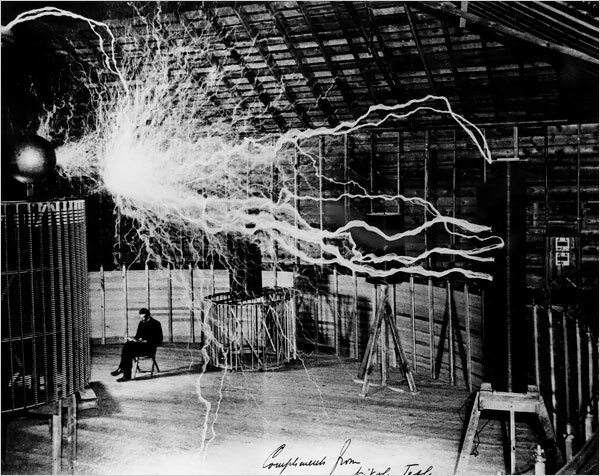 His own plan was to turn alternating current into electromagnetic waves that flashed from antennas to distant receivers. This is essentially what radio transmission is. The scale of his vision was gargantuan, however, eclipsing that of any rival. Investors, given Tesla’s electrical achievements, paid heed. The biggest was J. Pierpont Morgan, a top financier. He sank $150,000 (today more than $3 million) into Tesla’s global wireless venture. The shock wave hit Dec. 12, 1901. That day, Marconi succeeded in sending radio signals across the Atlantic, crushing Tesla’s hopes for pioneering glory. The nearby laboratory of red brick, with arched windows and a tall chimney, held tools, generators, a machine shop, electrical transformers, glass-blowing equipment, a library and an office. But Morgan was disenchanted. He refused Tesla’s request for more money. Desperate, the inventor pulled out what he considered his ace. The towers would transmit not only information around the globe, he wrote the financier in July 1903, but also electric power. Margaret Cheney, a Tesla biographer, observed that Tesla had seriously misjudged his wealthy patron, a man deeply committed to the profit motive. “The prospect of beaming electricity to penniless Zulus or Pygmies,” she wrote, must have left the financier less than enthusiastic. It was then that Tesla, reeling financially and emotionally, fired up the tower for the first and last time. He eventually sold Wardenclyffe to satisfy $20,000 (today about $400,000) in bills at the Waldorf. In 1917, the new owners had the giant tower blown up and sold for scrap. Today, Tesla’s exact plan for the site remains a mystery even as scientists agree on the impracticality of his overall vision. The tower could have succeeded in broadcasting information, but not power. “He was an absolute genius,” Dennis Papadopoulos, a physicist at the University of Maryland, said in an interview. “He conceived of things in 1900 that it took us 50 or 60 years to understand. But he did not appreciate dissipation. You can’t start putting a lot of power” into an antenna and expect the energy to travel long distances without great diminution. 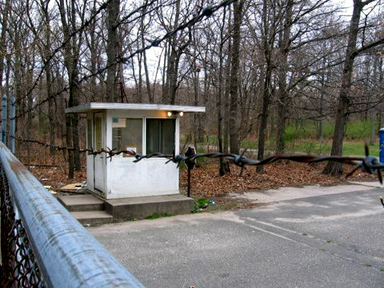 Wardenclyffe passed through many hands, ending with Agfa, which is based in Ridgefield Park, N.J. The imaging giant used it from 1969 to 1992, and then shuttered the property. Silver and cadmium, a serious poison, had contaminated the site, and the company says it spent some $5 million on studies and remediation. The cleanup ended in September, and the site was put up for sale in late February. Real estate agents said they had shown Wardenclyffe to four or five prospective buyers. Last month, Agfa opened the heavily wooded site to a reporter. “NO TRESPASSING,” warned a faded sign at a front gate, which was topped with barbed wire. Tesla’s red brick building stood intact, an elegant wind vane atop its chimney. But Agfa had recently covered the big windows with plywood to deter vandals and intruders, who had stolen much of the building’s wiring for its copper. The building’s dark interior was littered with beer cans and broken bottles. Flashlights revealed no trace of the original equipment, except for a surprise on the second floor. There in the darkness loomed four enormous tanks, each the size of a small car. 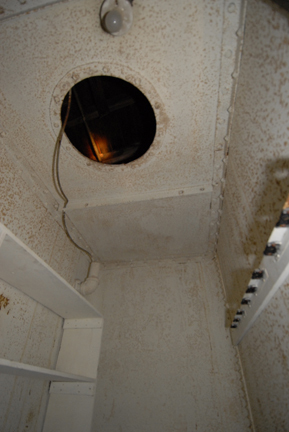 Their sides were made of thick metal and their seams heavily riveted, like those of an old destroyer or battleship. The Agfa consultant leading the tour called them giant batteries. Tesla authorities appear to know little of the big tanks, making them potential clues to the inventor’s original plans. After the tour, Christopher M. Santomassimo, Agfa’s general counsel, explained his company’s position: no donation of the site for a museum, and no action that would rule out the building’s destruction. Ms. Alcorn of the Tesla Science Center, who has sought to stir interest in Wardenclyffe for more than a decade, seemed confident that a solution would be worked out. 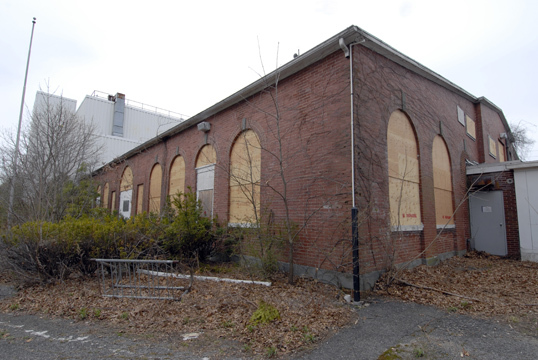 Suffolk County might buy the site, she said, or a campaign might raise the funds for its purchase, restoration and conversion into a science museum and education center. She said the local community was strongly backing the preservation idea. Sitting at a reading table at the North Shore Public Library, where she works as a children’s librarian, Ms. Alcorn gestured across a map of Wardenclyffe to show how the abandoned site might be transformed with not only a Tesla museum but also a playground, a cafeteria and a bookshop. Ms. Alcorn said the investigation and restoration of the old site promised to solve one of the big mysteries: the extent and nature of the tunnels said to honeycomb the area around the tower. OK. Yes, this site is still for sale. PROS: Complex of 14 industrial buildings, including historic Tesla laboratory. Property can be delivered fully cleared and level. CONS: Property was a New York State Superfund cleanup site, with the main concerns being silver and cadmium. Remediation was completed last year, but the site still requires semiannual groundwater monitoring as well as periodic inspections of two soil areas of concern, to ensure that they undergo no disturbance. If I had the extra capital, I wouldn’t hesitate to buy this facility. It would be a shame to see a Wal-Mart appear on the site of such former greatness (but it would be a wonderful analogy for the decline of America). Where is our Nikola Tesla of today? Tags: Nikola Tesla, Wardenclyffe, Wardenclyffe Laboratory, Wardenclyffe Tower. Bookmark the permalink. What were the tanks/batteries for? So some “scientists” say his claims of power distribution from the tower were not plausible…a lot of things were said about Einstein’s belief in dark matter; subsequently, a lot of those things turned out to be wrong! Nice article – thanks! Perhaps a soulution to fund the purchase of this historic property would be to solicite the help of the rock band Tesla which derives is name from Nikola Tesla to make some form of a donation to it’s name sake. With Tesla motors as an additonal source of funding. I am sure you can conjure up some sort of percentage that both of the above named sources would be aminable to , both as a source of comercial as well as social recognition as justification for contributions to fund this worthy endevor. I wish you all the best in bringing this purchase to fruition. I agree. A website to save this Location is in need. Seek contributions from the public. We aren’t ignorant like the demo people, we want to preserve importance here in the US. I realize I am late to this conversation, but there has been lots of activity to try to save this to make it into a museum. http://www.indiegogo.com/teslamuseum. A humorous approach, Matthew Inman or the Oatmeal comic strip was a driving force to save this building and get it into the hands of a preservation society that is trying to turn the property into a museum. 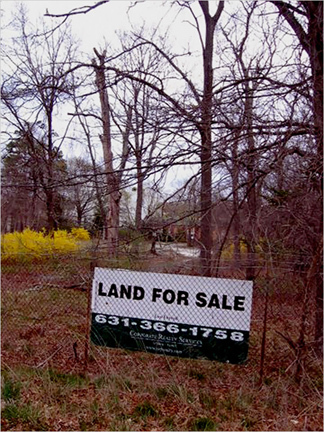 Money is still being raised to rehabilitate the land and purchase the property. Can it be protected as a historic landmark? http://www.TeslaScienceCenter.org is our website, with opportunities for giving via PayPal, etc. We have approached Tesla Motors, Tesla the Band, and various other organizations/businesses that have their basis in Tesla’s work, or in his name, but at this writing, we have not yet received any help from them. We can still hope. If you know of any contact people, please let us know. Tesla’s science is still being investigated, and there is still much to be learned. Once we have ownership of the laboratory, the tanks and any other residual equipment will be examined for their intended use, etc. As for whether or not his tower would have been able to transmit energy, that is a question still being debated by electrical engineers, physicists and others. Many of his other ideas and theories have yet to be investigated thoroughly enough to find out. We would love to register this site on the National and State Registers of Historic Places. This can most easily be accomplished by the owner (which we are not – yet!). Once we have acquired the property, we intend to register it as an historic site as a protection in the future, although even historic registration is not particularly protective. Nice information…… How tall was the wardenclyffe? Interesting they took the time to inform us that the tower couldn’t transmit power, a man ahead of his time, eh? This supposed unobtainable, untransmittable power, is the big secret. Egyptian, masonic, mayan, all the magoliths are the key. Ed Leedskalnin left us clues, whereas Tesla, under the light of scrutiny,had to protect and publish. And still got screwed by money. The last spark of ethical equilibrium in the scientific community. As I type on my new sidekick, I pay great repect, to the man, Nikola Tesla, you will be in my thoughts when your dream comes to fruition, mirrored and glazed in the eyes of your skeptics, and benefactors of your failure and misery in business, of which, ethics do not seem to exist. 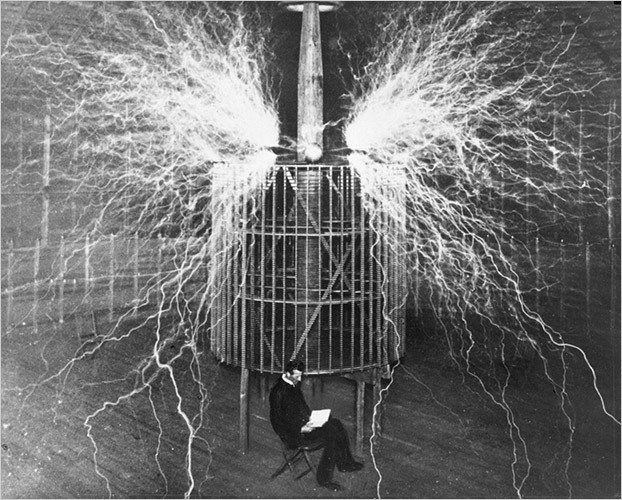 Nikola Tesla is the father of the 21st century. His work is greatly ignored because it benifits humanity, not individual human$. A few brave souls have lost thir lives proving his work. Research hho engines! Using aTesla technology he called electrolosis we can harness the awsome and clean power in tap water. By passing h2o over neg and pos charged plates we can seperate the hydrogen and oxygen from h20. hho gas will run internal combustion engines leaving only water vapor( which can be recaptured and reused) as exhaust! I posit that we make NT’s bday (july 7) a holiday showcasing working models that harness the power in nature. We might just wake the sleeping giant (the sheeple of our time ) if we could show the scope and depth of the deciept that enslaves us all . WE DON’T NEED fossil fuels or any of the antiquated power structures that come with all that BS. Anybody game? This is awesome, you always give reading gems. The place should be a museum in fact, and since Tesla was such a “shy” scientist it should be in such way that it portrays/preserve all his known and ignored inventions (even though as an Italian I’d be hurt for Marconi). it’s only fair.